Medicine for Your Spirit! 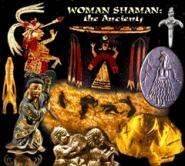 A rich multi-cultural record of medicine women, oracles, healers, trance-dancers and dreamers around the world. All of our Ancestresses. Two-disc DVD, 3 hours with music and commentary. This movie is a rich cultural record of medicine women, seers and oracles, healers, trance-dancers, shapeshifters, dreamers around the world. Many of us were taught that female spiritual leaders didn't exist, or were insignificant, or that they were rare exceptions. We were taught that Indigenous medicine ways were superstitions. Experiencing the beauty, power and wisdom of these spiritual legacies is medicine for your spirit. Especially for all the women who have been marginalized and silenced in the name of religion. You'll see rare images of women's ceremonies in rock art, ecstatic dancers, ceramic sculptures of female shamans, Shamanic crowns, shamanic valences of the witch in Europe, sacred staffs, rattles, fans, and mirrors. Visions, oracular chambers, casting of lots, and laying on of hands.